Philadelphia is a place rooted into America's history; so many significant events of this nation have taken place here. Two such events were the signing of the Declaration of the Independence and Consitution of the United State- both carried out in the Independence hall right in the old town of Philadelphia. The Declaration of Independence was signed and 13 American Colonies declared themselves independent states-no longer under British rule. The original draft, composed by Thomas Jefferson, was edited by congress and signed on 4th July 1776 declaring it as America's Independence Day. The Consitution of the United State was signed on 17th September 1787 which provided the framework of the government however its has undergone many changes over the years to suit changing times. It's 2 years to the day of the Scottish referendum on 18th September 2014 and the trip to Philadelphia has also raised the subject of the Scottish independence debate and will Scotland ever be an independent nation? Only time will tell, Alba gu bràth. George Washington's table, representing Virginia. Philadelphia is also thought to be birth place of the first American flag, and it is claimed to be made by Betsy Ross however this continues to be debated. Another symbol of American Independence is the Liberty Bell which can be seen in Philadelphia's Liberty Bell Centre. The Liberty Bell has also become a symbol of freedom for many different movements against oppression and marginalisation. Besides significant historic events, Philadelphia has grown and developed a respected art scene. It ranges from the Rodin museum to street art trails. During this time of year there are many art events in the city and it was a joy to attend an event at the Institute of Contemporary Art entitled The Freedom Principle which features music and art from jazz musician and painter Mughal Richard Abrams as well as AfriCOBRA cofounder Wadsworth Jarred. The city of Philadelphia has also adopted the symbol of LOVE Philadelphia as its logo. 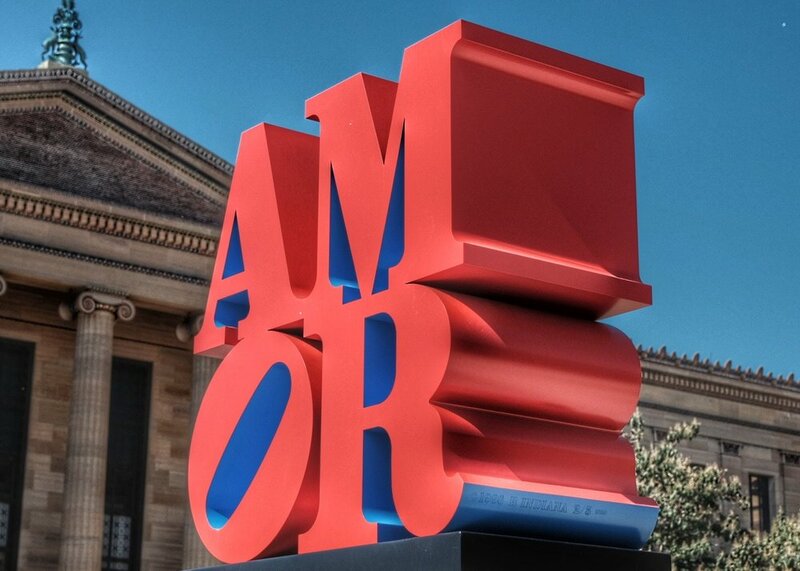 The "Love" sculpture was designed by Robert Indiana in 1976 and now you can find different sculptures of "Love" scattered all around the city.